AGIR: Resilience, a buzzword or a long-term commitment? After three years of consultations following the adoption of a regional roadmap for the Global Alliance for Resilience (AGIR), the West African region can proudly announce that all 17 Sahelian and West African countries have embarked on an ambitious process to define their national resilience priorities (NRP-AGIR). To date, six countries (Burkina Faso, Chad, Côte d’Ivoire, Mali, Niger and Togo) have validated their NRPs; five countries (Cape Verde, The Gambia, Guinea-Bissau, Mauritania and Senegal) are in the process of validation. While some partners are growing impatient, others underline the quality and inclusiveness of a process that is laying the groundwork for future implementation. AGIR stakeholders took stock of progress made in developing the NRPs during the recent meeting of the Food Crisis Prevention Network (RPCA) on 15 April 2016 at the OECD headquarters in Paris. Some national representatives are asking for additional financial support (“We have advanced well, but we need more support”), while technical and financial partners want to further improve the quality of co-ordination and are eagerly awaiting the concrete next steps in implementing the NRPs. In this context, it is worth recalling that AGIR is not just another programme or initiative. It is a policy tool which aims to channel the efforts of regional and international stakeholders toward a common results-based framework to achieve the “Zero Hunger” goal. It is also a long-term political partnership to improve the effectiveness of Sahelian and West African resilience initiatives. In reality, the implementation of many resilience projects has already started… and for most Sahelians and West Africans, resilience has been part of their lives for a long time. What has been achieved since the creation of AGIR? An affirmed, strong West African leadership is the first and maybe most important achievement. The Alliance is run under the political guidance of ECOWAS and UEMOA, with the technical support of CILSS, which hosts the AGIR Support Unit that facilitates co-ordination and supports countries in their efforts to conduct inclusive dialogues. All national governments are involved in the process. AGIR is based on existing platforms and networks, in particular the RPCA, which plays a key role in implementing the Alliance and lobbying on the international scene – a “win-win” situation for AGIR to capitalise on and strengthen existing networks and structures. Improved mobilisation of development partners. Resilience had almost disappeared from the development agenda and was powerfully re-introduced in 2012 when humanitarian and development actors recognised that recurrent food crises in the Sahel can only be tackled if the root causes of food insecurity are addressed through a systematic and long-term approach. AGIR recognises that resilience-building is necessarily a long-term endeavour that can only be achieved through full national and regional ownership; it recognises that it is not only better but cheaper to invest in prevention and preparedness of the most vulnerable populations. All stakeholders clearly acknowledge the importance of a multi-sectoral approach, recognising that agricultural production and better functioning markets alone will not be sufficient to build the resilience of vulnerable populations. In this respect, the NRP process is not a simple copy and paste of existing policy texts. On the contrary, the NRP process provides a new reading of existing policies that goes beyond agriculture and food security concerns. It involves a large number of different ministries and portfolios: education, health, territorial planning, rural/urban development, gender issues, etc., that all contribute to reducing vulnerability and building resilience. The efficiency of multi-sectoral approaches is broadly recognised, but the actual implementation on the ground still poses immense challenges for West African policy makers and development partners alike. Last but not least, another important achievement is the inclusiveness of the process, with a clear effort to involve civil society representatives. Eight networks of civil society organisations have participated in the work of the Alliance since the very beginning. “They have become true ambassadors for AGIR at both the regional and international levels”, confirms CILSS Technical Unit Co-ordinator Martin Issa Bikienga. This is a good starting point; the relevance of their contributions must be further enhanced and made sustainable. What are the next steps? What are the challenges? The most critical next step is to finalise the NRP process in the remaining countries. The RPCA meeting conclusions urged all AGIR stakeholders to “renew their commitment to the Alliance, by: i) providing support to countries working towards the validation of their priorities; and ii) providing support and guidance to national and regional actors, to ensure an effective integration of the NRP-AGIR into the next generation of national agricultural investment plans.” It will also be important to capitalise on the three-year consultation process and identify best practices so that countries can learn from each other’s experiences, success stories and difficulties. The few outstanding NRPs should not keep other countries from advancing. This is just the first step in a long-term dialogue process that must be pursued steadfastly if AGIR wishes to consolidate a multi-sectoral approach. In terms of implementing the NRPs, the next step will be for countries to speed up the implementation of the identified resilience priority projects by allocating national budgets (if not already done) and mobilising their partners to cover financial gaps. Some AGIR pillars, in particular pillar 3 aimed at “sustainably improving agricultural and food production, the incomes of vulnerable households and their access to food”, could also potentially benefit from climate financing. Lastly, AGIR needs to make further headway toward improving co-ordination and measuring impacts. It is currently impossible to get an overview of the many projects already being conducted on the ground in the region and even less to measure their impact. 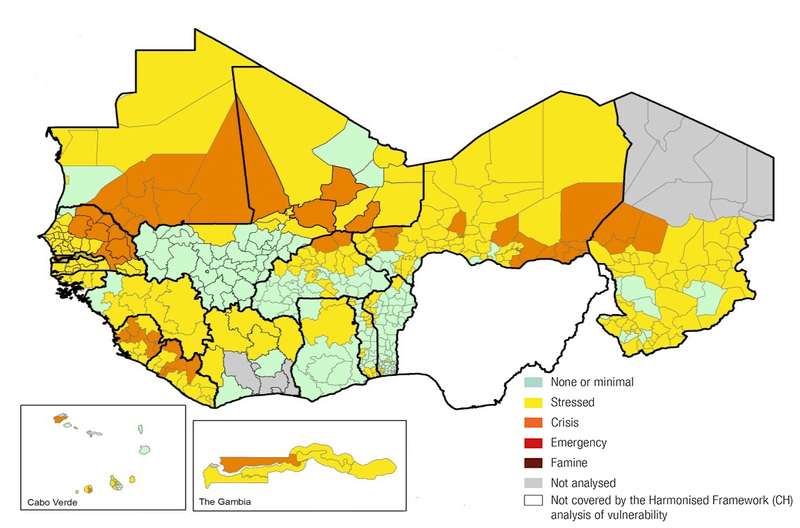 The RPCA has started working on resilience impact measures, and an interactive mapping tool to geo-localise the many resilience, food and nutrition initiatives is under way, with the support of the Sahel and West Africa Club Secretariat. This work will help monitor and evaluate the Alliance’s outcomes, as well as foster synergies and the convergence of resilience initiatives. For many West African policy makers the resilience debate that gained international interest in 2012 was nothing new. They may not have had dedicated national resilience priorities, but resilience has always been a concern for West African governments and regional organisations. The challenges remain enormous: whether there is a good or bad harvest, every year, the region must deal with at least 3 to 4 million chronically food insecure people. Malnutrition is a serious, permanent concern: one out of five children under five in the Sahel is undernourished. This year, almost 2 million children will be affected by the most severe form of acute malnutrition, if no appropriate measures are taken. For those who are still sceptical and for whom resilience still sounds like a buzzword, we need to convince them that building resilience is not a passing fad but requires a very urgent, yet long-term commitment. In this guest contribution to the SWAC blog, Kirsty Lewis of the UK Met Office Hadley Centre explores the relationship between climate change and food insecurity in developing and least developed countries. The research projections paint both stark and cautiously optimistic pictures. Failure to adapt to and mitigate climate change will drastically increase food insecurity, however; successful adaptation and mitigation efforts could actually reduce vulnerability. What do the results of this research mean for West Africa? What are the region’s priorities for decreasing vulnerability to food insecurity in the face of climate change? While it is well-understood that climate change will mean increasing frequency and intensity of extreme weather events around the world, and that we are already seeing this trend in our observations of climate, what this trend will mean in detail is harder to evaluate. Increasing floods, droughts and storms pose a threat to the stability of food production, and therefore food security, in global terms, but to respond to this threat we need evidence on the scale and geography of the threat, as well as the effectiveness of mitigation and adaptation action to tackle it. Scientists from the UK Met Office Hadley Centre have been working closely with the World Food Programme over the last five years on the challenge of incorporating our climate science knowledge with food security expertise. Together we have developed an index of vulnerability of countries to food insecurity, as a result of flood and drought events, for developing and least-developed countries. The approach we took considered the IPCC1 definition of vulnerability as a combination of exposure, sensitivity and adaptive capacity. For each of these terms we included measures of food system function that correlated with undernourishment. For the exposure component, for example, this was a measure of the number of floods and droughts that occurred over agricultural production regions and populated areas, within each country. The sensitivity component included measures of how resilient agricultural production is to adverse weather events. This included metrics such as the percentage of rain-fed agriculture. Finally the adaptive capacity component included measures of economic resilience, such as the percentage of the population below the poverty line, or structural resilience, such as the percentage of paved roads. In this way the index included, not just the impact of weather on production, but also on access to food through markets. The index values were normalised, and so are a relative, rather than absolute, measure of vulnerability to food insecurity. The results of this index in the present day climate are shown in the figure below. In addition we developed adaptation scenarios, which effectively alter the remaining two components of the index: sensitivity and adaptive capacity. We defined a ‘high adaptation’ scenario where both the sensitivity of agricultural production and the economic resilience were improved by around 10-15% in the 2050s, and a further 10-15% in the 2080s. In this scenario the change was not applied equally to all countries, allowing the most vulnerable countries to improve more rapidly than the least vulnerable. A second ‘low adaptation’ scenario was also created, with improvements of around 5-10% per time period to the non-climate aspects of the index. While using the climate model projections under the RCP scenarios was a straightforward choice, selecting adaptation scenarios was a lot more difficult. The chosen high and low adaptation scenarios are representative of plausible levels of adaption, but of course these are not a forecast of future behaviour. The resulting index projections under the different climate change and adaptation scenarios provide some interesting and informative insights into both the geography of climate change impacts on food security and the relative importance of adaptation and mitigation to address these impacts. If we assume no adaptation action is taken, i.e. we just consider the impact of climate change, we see that vulnerability to food insecurity increases by the 2050s globally, regardless of which mitigation scenario is followed. For example, under a scenario of rapid and sustained reductions in greenhouse gas emissions, known as RCP 2.6, (which is also consistent with a global average temperature rise of around 2°C) the level of increase of vulnerability to food insecurity is less than for the scenario of considerable future increasing emissions, known as RCP 8.5 (which is consistent with an end of the century global average temperature rise of 4°C or more). Nevertheless, both scenarios result in deteriorating food security conditions. This is because ‘inertia in the climate system’ (a delayed response of warming from previous emissions) means that we are committed to some level of climate change in the next few decades. Beyond the 2050s the two scenarios diverge. Under the RCP2.6 scenario, the rate of climate change levels off, and vulnerability to food insecurity stabilises. It is still worse than the present day, but no worse than the 2050s. Under the RCP8.5 scenario however, the levels of vulnerability to food insecurity increase considerably. This scenario of no action on either mitigation or adaptation is the worst case future, and the consequences for food insecurity are severe. However, a scenario where no adaptation takes place is unlikely to be realistic, so we can compare these outcomes with an alternative ‘high adaptation’ scenario. In this case we see that adaptation makes a difference in reducing vulnerability to food insecurity at all timescales and with or without mitigation. For example, under the RCP8.5 climate change scenario, adaptation almost keeps pace with climate change out to the 2050s, meaning that vulnerability to food insecurity remains at levels comparable, although a little worse, than the present day. After the 2050s though, the rate of climate change increases and outpaces adaptation efforts. In this scenario the 2080s are not as bad as they would be without adaption, but still worse than the present day. There is one scenario where the future vulnerability to food insecurity is lower than the present day. This is the scenario where there are rapid and sustained reductions in greenhouse gas emissions (RCP2.6), and high levels of adaptation. In this scenario adaptation keeps pace with climate change to the 2050s, and beyond this timeframe, as the climate stabilises, continued adaptation leads to reductions in vulnerability and an improving food security outlook. The messages from this research are clear. If we take no action to tackle climate change, the consequences for food insecurity in developing and least developed countries are severe. However, by both adapting and mitigating we can tackle climate change in a way that has positive consequences for future food insecurity. The aim of the research that we conducted was to put information and evidence about the impacts of climate change and the effects of mitigation and adaptation efforts into the public domain. We created an interactive website to show these results, and so you can see for yourself how climate change and vulnerability to food insecurity interact. Kirsty Lewis is Climate Security Science Manager with the Met Office Hadley Centre. 1 Intergovernmental Panel on Climate Change. Definition of ‘key vulnerability’: https://www.ipcc.ch/publications_and_data/ar4/wg2/en/ch19s19-1-2.html. 2 Representative Concentration Pathways are used for climate modelling and research. They describe four possible climate futures, all of which are considered possible depending on how much greenhouse gases are emitted in the years to come, https://en.wikipedia.org/wiki/Representative_Concentration_Pathways. Both urban and rural areas in West Africa are undergoing considerable transformation. As an ever greater proportion of the region’s population live – and will live – in urban centres, how can policies help ensure that rural residents are not ‘left behind’, and at the same time food production satisfies the needs of the growing urban population?